Nobody now knows when gardeners in the Lothians and Fife began to organise. 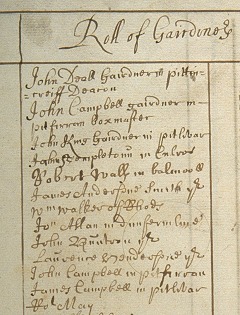 The earliest surviving records come from Haddington (1676) and Dunfermline (1715). There has always been a general need amongst working men to secure sickness benefits, pensions and provision for their dependants. So both societies may be even older. In cities and burghs (towns) there medieval trades incorporations. Incorporations had contracts between themselves and the town or city council as representatives of the community. Each stated the prerogatives of the craft, membership qualifications and how they were to organise. 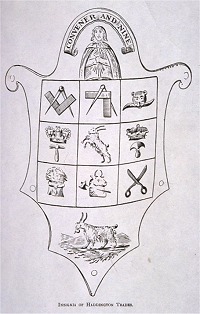 The Incorporation of Gardeners of Glasgow is believed to be only such group in Scotland to gain that status. The gardeners and greengrocers had become an incorporation of the city by 1626. Nowhere else had a gardeners' incorporation and by the seventeenth and eighteenth centuries incorporations had ceased to be created. Some newly arising trades were adopted by existing incorporations. In common with other professions gardeners organised because they felt a pressure to regulate skills and training to protect their own reputations. But gardeners in particular lived outside burghs on nearby landed estates or market gardens and so could not become burgesses, the essential qualification to join incorporations. Gardeners' societies had been long established in Europe. Scotland's North Sea trading links may have helped spread the idea in the eastern lowlands. Further, there was an established alternative that could be adopted by gardeners. They could organise as a 'fraternity' or 'society'.